Learning to play an instrument can help your child fine-tune her ear and enhance skills needed for education and social interaction. Music and math are highly intertwined. By understanding beat, rhythm, and scales, children are learning how to divide, create fractions, and recognize patterns. It seems that music wires a child’s brain to help him better understand other areas of math, says Lynn Kleiner, founder of Music Rhapsody in Redondo Beach, CA. As kids get older, they’ll start reciting songs, calling on their short-term memory and eventually their long-term memory. Using a mnemonic device to do this is a method that can later be applied to other memory skills, says Mary Larew, Suzuki violin teacher at the Neighborhood Music School in New Haven, Connecticut. Musical instrument classes also introduce young children to basic physics. For instance, plucking the strings on a guitar or violin teaches children about harmonic and sympathetic vibrations. Even non-string instruments, such as drums and the vibraphone, give big kids the opportunity to explore these scientific principles. Certain instruments, such as percussion, help children develop coordination and motor skills; they require movement of the hands, arms, and feet. This type of instrument is great for high-energy kids, says Kristen Regester, Early Childhood Program Manager at Sherwood Community Music School at Columbia College Chicago. String and keyboard instruments, like the violin and piano, demand different actions from your right and left hands simultaneously. “It’s like patting your head and rubbing your belly at the same time,” Regester says. Instruments not only help develop ambidexterity, but they can also encourage children to become comfortable in naturally uncomfortable positions. Enhancing coordination and perfecting timing can prepare children for other hobbies, like dance and sports. It refines discipline and patience. Learning an instrument teaches children about delayed gratification. The violin, for example, has a steep learning curve. Before you can make a single sound, you must first learn how to hold the violin, how to hold the bow, and where to place your feet, Larew says. Playing an instrument teaches kids to persevere through hours, months, and sometimes years of practice before they reach specific goals, such as performing with a band or memorizing a solo piece. “Private lessons and practicing at home require a very focused kind of attention for even 10 minutes at a time,” Larew says. 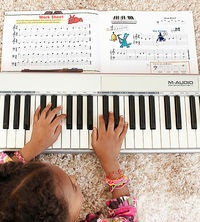 Group lessons, in which students learn to play the same instruments in an ensemble, also improve patience, as children must wait their turn to play individually. And in waiting for their turns and listening to their classmates play, kids learn to show their peers respect, to sit still and be quiet for designated periods of time, and to be attentive. Lessons offer a forum where children can learn to accept and give constructive criticism. Turning negative feedback into positive change helps build self-confidence, Regester says. Group lessons, in particular, may help children understand that nobody, including themselves or their peers, is perfect, and that everyone has room for improvement. “Presenting yourself in public is an important skill whether you become a professional musician or not,” Larew says. This skill is easily transferrable to public speaking, she adds. And, of course, once a child is advanced enough, she’ll possess musical skills that will help her stand out. It introduces children to other cultures. By learning about and playing a variety of instruments, kids can discover how music plays a critical role in other cultures. For instance, bongos and timbales may introduce children to African and Cuban styles of music. Although the modern-day violin has roots in Italy, learning to play it exposes children to classical music popularized by German and Austrian musicians. Versatile instruments, such as the violin and piano, can accompany a wide repertoire of styles, including classical and jazz (which originated in the American South). It’s important to familiarize children with other cultures at a young age because this fosters open-mindedness about worlds and traditions beyond the ones they know. Is your child excited about the instrument? Does she like the way it sounds and feels? Some music schools offer a “petting zoo” that introduces kids to multiple instruments. Is the instrument too challenging or is it not challenging enough (for both you and your child)? Does your child’s temperament match the instrument? Can you afford the instrument and the maintenance that comes with it? As a parent, do you like the sound enough to listen to your child practice it for hours at home? Is your child specifically interested in a particular music style? If so, factor that into your instrument choice, as some specifically cater to certain styles. For instance, a violin player will have a hard time fitting in a jazz ensemble. Experts don’t always agree on which instruments are best for big kids to learn, but many music teachers do agree that it’s hard to go wrong with the piano, percussion (like the drum or xylophone), recorder, guitar, or violin.